Massage Milk releases a book: You May Not Associate! Wang Xiaofeng's blogbook You May Not Associate has recently burst onto the market. The book's name, You May Not Associate, has nothing to do with that ‘No Lenovo [Chinese computer manufacturer Lenovo's Chinese name is 联想, the verb ‘associate’.’ This book's author is the blogsphere's famous ‘Massage Milk,’ known as the Stephen Chow of blogging, who brings light to the cultural world's current strange state of affairs with poignant and witty language, with a pen drawing blood like a sword. Wang Xiaofeng, once a rock ‘n’ roll youngster, today is an editor at Lifeweek. Just like some classic capitols, he works within this system with extra-system thoughts and critique; gets paid by the state, but scrutinizes it on behalf of the people. Wang Xiaofeng opposes the current vulgar culture just as much as he opposes pretense, the lowbrow, complacency and vacuuity, all based on a simple view of morality and human nature. Wang Shuo once used ‘hooligan’ to ruthlessly poke holes in a pretentious cultural system and an orthodox literature. Today, it's as if Wang Xiaofeng has inherited this contrarian's spirit, and uses Massage Milk to continue puncturing the increasingly artificial cultural situation at present. This is where Wang Xiaofeng's vitality lies. 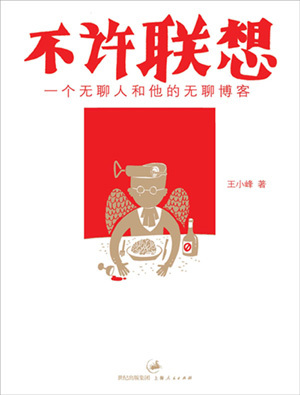 But, letting You May Not Associate this kind of cultural critique book take on the role of challenger of ways of thinking is inappropriate, when on his blog, Wang Xiaofeng has always maintained his personal stance as a cultural critic. This is worth everyone's praise. Cultural mood is society's spiritual meter and You May Not Associate has grasped this point. In the way culture's chronic illnesses are piercingly taken on, it's almost as though the author doesn't wish to directly admit to a concern for humanity. Both praising and tearing down Wang Xiaofeng and his book violate the realistic principles that he embraces. Maybe the most realistic aspect is that contemporary culture places us in delicate and awkward circumstances. You Must Not Associate doesn't really say to not associate. One can't be dishonest, or too honest either. This is an ambiguous time (just as Massage Milk shows), silly one minute and severe the next. It's the worst of times, and the best as well. In these times, Wang Xiaofeng is like a fish in water, swimming freely. Wang Xiaofeng, Capricorn. Currently culture editor at Lifeweek. He uses twisted and cool language [a reference to his earlier blog, hosted by 歪酷 or ‘twisted cool’] to record life experiences at Massage Milk, everyone's current favorite Chinese blog. His new work, You May Not Associate, was published by Shanghai People's Publishing House in [May] this year and can be found at all big bookstores. You May Not Associate is a collection of his social and entertainment commentary, essays and stories published in newspapers, magazines and on his blog over the past two years. The social and entertainment commentary deals frankly with all the strange news and happenings, from underground and entertainment circles, with humor, sarcasm and wit. Essays are written about life with sass, friends are profiled, and at the same time he doesn't forget to write about the various hilarious and infuriating things he comes across in plain black and white. The story section is written like the script of a play, and deals with and exaggerates the social commentary part. In the book his frequent twisting and ‘misunderstanding’ of otherwise ordinary words gives them an an abundance of flavor and meaning. Xie “Beard” Feng's accompanying drawings and illustrations provide a luxurious contrast. Blogger ZKT219, however, takes a critical view of blogs becoming books, and sees them as just a passing trend that have about as much literary value as screen adaptations of works of literature, and as a trend with a limited lifespan. Since spring this year we've seen an upsurge in famous bloggers publishing books. Xu Jinglei‘s Old Xu's Blog printed a hundred thousand copies. Soon after came Soho China president Pan Shiyi‘s blogbook Pan Shiyi's Blog. Wenhui Publishing House is working on Zheng Yuanjie‘s blogbook Zheng Yuanjie, Sudden Blogger, and Lifeweek editor Wang Xiaofeng's collection of blog commentary You May Not Associate: A Boring Person and His Boring Blog. The authors think celebrity blogbooks must be published, when in fact they leave people a little confused. Besides, publishing blogbooks seems a little excessive. This word ‘bo-ke’ comes from the English word blog. Blog is short for weblog. Weblog is an online log of records for publishing and reading, most often called a ‘net diary.’ Put simply, blogs are just a way to easily and quickly publish your feelings online, an effective and easy way to immediately begin interacting with other people and serve as a stage on which to display your rich and colorful individuality. In today's ever-so wired world, writing one's own blog or reading others’ has already become a way of life for some people. It allows participants to express their innermost feelings and abundant life content. Usually, the writing and reading of blogs is pretty laidback. Writers write in a rather relaxed state of mind, and readers are also in a relaxed state of mind as they browse. Should be said that relaxed and laidback are the characteristics of blogs. And now today, with blogs being separated from the internet, taking blog content and turning it into books, shows that things have gone too far. As I see it, all media have their own characteristics and advantages, but this crude ‘crossbreeding’ seems a little bland. For example, the so-called ‘video books’ which to a very large extent lose any resemblance to literature, are published hastily blindly following film and television and use cliche to attract readers’ eyeballs to the movie and television pictures. But the writing is crude and scenes are dragged out. Reading books like these is like chewing wax. Today's blogbooks to a large extent are following in film and television's dusty tracks. Another reason for blogs’ allure lies with the ‘diary’ aspect; they're constantly renewed. That's why readers are so happy to read the blogs of famous people. One important reason is that attention paid to celebrities’ real lives naturally does not remove attention paid to their personal lives. And the publishing of blogbooks naturally has its limits. No matter what, they'll always only be records of things gone past and will never be able to keep up with the internet. In this regard, blogbooks by all appearances lack the ability to remain relevant, giving a big boost to the appeal of reading. The point is, celebrity blogbooks rushing into publication still all has to do with economic benefits: authors stand to bring in not a small amount of royalties, and booksellers also hope to get some of that. But, will or will not readers buy it? A simple logic. Online, blogs can be freely browsed; why then must I use printed media just to read them? As I see it, blogs on paper is like a kind of generic product. Not only does it not have the flair and design that a blog does, but they're also very different from the usual celebrity biography. In any regard, I have no plans to buy any celebrity blogbooks. Because celebrity blogs are right beneath my mouse. Just a click is enough. Absolutely no need to run to any bookstore. On a more positive note, Tom Jian, an old reader of Wang “Three Watches” Xiaofeng's work, looks at how Wang started blogging, how his writing has changed over the years, and provides some pretty convincing reasons why you should go buy this book. I never thought that teacher Wang Xiaofeng would ever become an amusing person. When he became well-known it was for being an angry youth. Some people called him a ‘madman,’ and even more people said he was not to be provoked, anyone too close would get it. Later he started a BBS called Music From the Second Room. It was already quite hot by the time I got around to checking it out. My first time I saw brother Three Watches inside letting ‘er rip and jumping around. Then later on Three Watches couldn't contain his anger anymore and shut the BBS down. Then he started blogging. From then on, Three Watches’ language took flight. In blog heaven he fluttered about, completely free. Several years of blog literature has now become this book You May Not Associate. You May Not Associate proves there remains a reason for the continued existance of white paper and black letters. First I wondered, what's the point of making a book out of things already written on a blog? Isn't this the age of looking at pictures and watching screens? And this was all online stuff to begin with. Yet reading those words after having been put on paper, they really do have flavor. This can only be Three Watches’ fault for writing too amusingly. What kind of person is Three Watches? He's a serious person, a precise person, a person who has a sense of responsibility towards society. He's someone who dares to criticize, who doesn't bother with conventions……but the most important is that he's an amusing person. He's so good at taking the vapid and writing something that will make you laugh and snarl at the same time. Writing that relaxes and enlightens those that read it. Any book like this that can tear you away from your computer and become something you make time for, has got to be significant. Although Three Watches himself calls it ‘a boring person and his boring blog,’ after having seen what a legitimately boring person I myself am, it should actually read ‘an amusing person and his amusing blog.” Considerably amusing at that.